Ms. Cilka is responsible for asset sourcing, investment analysis and executing certain structured credit investment mandates. She works closely with the business development group on client relationship efforts. Ms. Cilka joined DFG in March 2007 from HVB Group, where she worked for 10 years in the controlling group responsible for credit and market risk reporting of all business units including credit, securities, derivatives and other contingent liabilities. 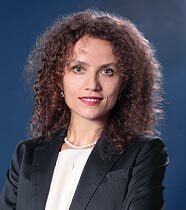 In 2006 she joined HVB’s Active Credit Portfolio Management Group, reporting to Mr. Volkan Kurtas. Ms. Cilka received a Diploma in Physics from the University of Tirana, Albania in 1994, an M.B.A. from Pace University in 2000 and an M.S. in Financial Engineering from Baruch College in 2007.